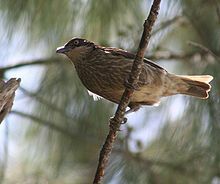 There is less sexual dimorphism in plumage, however, with only 25 species showing such differences between the two sexes. The plumage of the starling is often brightly coloured due to iridescence; this colour is derived from the structure of the feathers, not from any pigment. 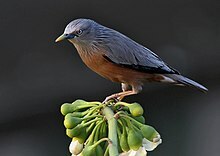 Some species of Asian starling have crests or erectile feathers on the crest. Other ornamentation includes elongated tail feathers and brightly coloured bare areas on the face. These colours can be derived from pigments, or, as in the Bali starling, structural colour, caused by light scattering off parallel collagen fibres. 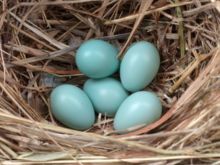 The irises of many species are red and yellow, although those of younger birds are much darker. The European starling was purposefully introduced to North America in 1890–1891 by the American Acclimatization Society, an organization dedicated to introducing European flora and fauna into North America for cultural and economic reasons. Eugene Schieffelin, chairman at the time, allegedly decided all birds mentioned by William Shakespeare should be in North America (the bird had been mentioned in Henry IV, Part 1). A hundred of them were released from New York's Central Park. Starlings imitate a variety of avian species and have a repertoire of about 15–20 distinct imitations. They also imitate a few sounds other than those of wild birds. The calls of abundant species, calls that are simple in frequency structure and show little amplitude modulation, are preferentially imitated. There are local dialects of mimicked sounds. 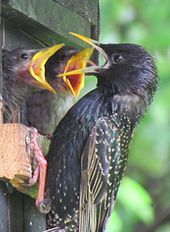 The starling family Sturnidae was introduced (as Sturnidia) by the French polymath Constantine Samuel Rafinesque in 1815. 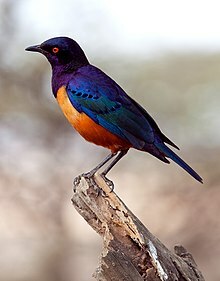 The starlings belong to the superfamily Muscicapoidea, together with thrushes, flycatchers and chats, as well as dippers which are quite distant and Mimidae (thrashers and mockingbirds). The latter are apparently the Sturnidae's closest living relatives, replace them in the Americas, and have a rather similar but more solitary lifestyle. They are morphologically quite similar too—a partly albinistic specimen of a mimid, mislabelled as to suggest an Old World origin, was for many decades believed to represent an extinct starling (see Rodrigues starling for details). Usually the starlings are considered a family, as is done here. Sibley & Monroe included the mimids in the family and demoted the starlings to tribe rank, as Sturnini. This treatment was used by Zuccon et al. However, the grouping of Sibley & Monroe (besides leaving the subfamily rank vacant[verification needed]) is overly coarse due to methodological drawbacks of their DNA-DNA hybridization technique and most of their proposed revisions of taxonomic rank have not been accepted (see for example Ciconiiformes). The all-inclusive Sturnidae grouping is all but noninformative as regards biogeography, and obscures the evolutionary distinctness of the three lineages. Establishing a valid name for the clade consisting of Sibley/Monroe's "pan-Sturnidae" would nonetheless be desirable to contrast them with the other major lineages of Muscicapoidea. The Philippine creepers, a single genus of three species of treecreeper-like birds appear to be highly apomorphic members of the more initial radiation of the Sturnidae. While this may seem odd at first glance, their placement has always been contentious. In addition, biogeography virtually rules out a close relationship of Philippine creepers and treecreepers, as neither the latter nor their close relatives seem have ever reached the Wallacea, let alone the Philippines. Nonetheless, their inclusion in the Sturnidae is not entirely final and eventually they may remain a separate family. ^ Zimmer, Carl (2 May 2006). "Starlings' listening skills may shed light on language evolution". The New York Times. Retrieved 14 January 2009. ^ Feare, Chris; Craig, Adrian (1998). Starlings and Mynas. Helm Identification Guide. London: A&C Black. ISBN 978-0713639612. ^ Doughty, Chris; Day, Nicholas; Andrew Plant (1999). Birds of the Solomons, Vanuatu & New Caledonia. London: Christopher Helm. ISBN 978-0-7136-4690-0. ^ Mirsky, Steve (May 23, 2008). "Shakespeare to blame for introduction of European starlings to U.S". Scientific American Magazine. Retrieved November 14, 2012. ^ Prinzinger, R.; Hakimi G.A. (1996). "Alcohol resorption and alcohol degradation in the European Starling Sturnus vulgaris". Journal für Ornithologie. 137 (3): 319–327. doi:10.1007/BF01651072. ^ Sibley, Charles Gald; Monroe, Burt L. Jr. (1990). Distribution and Taxonomy of the Birds of the World: A Study in Molecular Evolution. New Haven, CT: Yale University Press. ISBN 978-0-300-04969-5. ^ a b c d e f Zuccon, Dario; Cibois, Alice; Pasquet, Eric; Ericson, Per G.P. (2006). "Nuclear and mitochondrial sequence data reveal the major lineages of starlings, mynas and related taxa". Molecular Phylogenetics and Evolution. 41 (2): 333–344. doi:10.1016/j.ympev.2006.05.007. PMID 16806992. ^ a b Cibois, A.; Cracraft, J. (2004). "Assessing the passerine 'tapestry': phylogenetic relationships of the Muscicapoidea inferred from nuclear DNA sequences". Molecular Phylogenetics and Evolution. 32 (1): 264–273. doi:10.1016/j.ympev.2003.12.002. PMID 15186812. This page was last edited on 5 March 2019, at 17:41 (UTC).